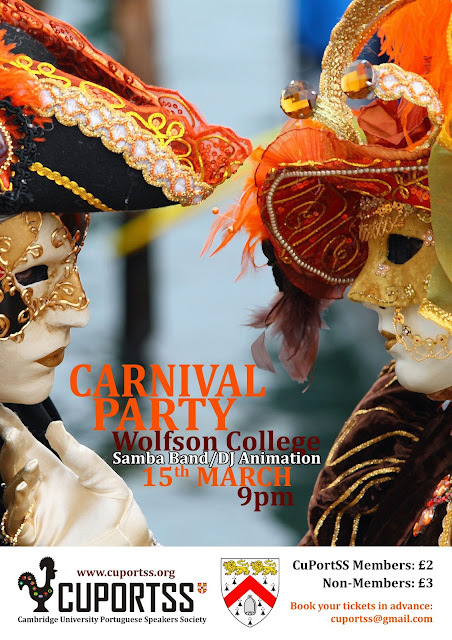 After the success of last year, we will continue to celebrate Carnival in the Wolfson College. It is a great opportunity to show the Portuguese and Brazilian in the University of Cambridge, one the big aims of CuPortSS. We are happy to announce that the Samba Band Arco Iris, the best Samba Band in town, will make a performance starting at 10pm. Music animation will be provided by resident DJs. Be ready to have a nice time, dancing to the rhythms of Brazilian music. We will sell 100 tickets in advance, to guarantee that all CuPortSS members and friends will enter on this party. To guarantee our place, please send an email to cuportss@gmail.com with “Advance ticket for Carnival party” as subject (first-come first-served basis). Remember to bring your fancier mask and costume, since this is a Carnival party. There will be a prize for the best costume!! Cristina Carvalho is author of several novels, such as A Casa das Auroras (2011), O Gato de Uppsala and Nocturno: o romance de Chopin (2009). She has also published in magazines and journals, namely in Jornal de Letras and Egoísta. Her most recent novel, Marginal, is launched next week in Lisbon. Cristina Carvalho will focus on her writing career and her literary work. Introduced by Luisa Pinto Teixeira, and discussed by Maria José Ribeiro, the lecturer of Portuguese of Camões, IP. at King’s , the writer will then answer questions from the public. For any enquiries about the Society and/or its events leave a comment in one of our posts, join our group on Facebook or email us at cuportss[at]gmail.com. CUPortSS. Awesome Inc. theme. Powered by Blogger.